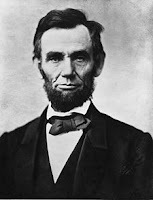 Today is the 12th February and is the 200th anniversary of Abraham Lincoln's Birthday. He is a man who held the Presidency of the USA during some of it's darkest days and yet he is recognised as one of the greatest Statesmen to have ever held such high office. The now most famous speech "The Gettysburg Address" delivered in November 1863 remains to this day one of the greatest speeches ever given. The Civil War still raged on and in drawing attention to the Declaration of Independence signed some "four score and seven years" prior he called the Nation to stand again under the flag of the USA. He so carefully crafted his words in dedicating the Graveyard at Gettysburg to remind the Nation of its very core, it remains as the true spirit of a proud nation growing and evolving as one nation. The USA again faces dark times as it has so many times before - of one thing we can be certain, it will recover from this time, and it will remain the truly great nation that remains strong under Liberty's Flame - "Give me your tired, your poor,Your huddled masses yearning to breathe free,The wretched refuse of your teeming shore.Send these, the homeless, tempest-tossed to me,I lift my lamp beside the golden door!" Poilticians are all pathetic "dweebs"
How wrong can these guys get it? So now the Banks want to give back the money!